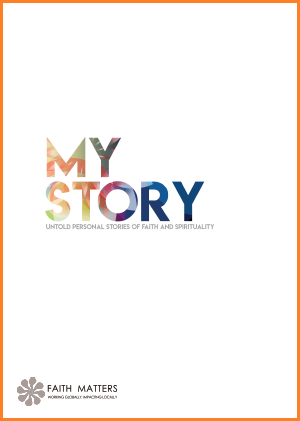 My Story is a new project launched by Faith Matters, which brings forward the untold stories of faith and spirituality within local, national, and international contexts. If the stories are separated by distance, they are bound by a unifying aim: to promote change and to promote tolerance and understanding in their communities, and in communities abroad. Through My Story, Faith Matters hopes to empower young activists and bring their unique voices forward and support them in reaching a wider audience. In this project, we would like to offer our audience a close-up experience of personal stories, encouraging listening and opportunities to reflect on the experiences of others. The main aim of My Story is to challenge those who seek to divide communities by offering a different story, an individual, personal, and honest story. Participants explain, in their own words and images, how their faith is not a passive act, but an act that is both deeply personal and a way of being. A Muslim woman, who wears the hijab, was travelling on London Underground with her young child when a man racially abused her and told to ‘go back to Syria’ and ‘f*ck off back to your own country’. The incident occurred on February 24. Speaking to Tell MAMA, the mother, who wishes to remain anonymous, stated that when she reported the racist abuse to Transport for London (TfL) staff, she described an overall ‘lack of empathy’ for her situation. She then observed a member of TfL staff ‘shaking hands’ with the perpetrator and allowing him to board the next train. Further allegations concern the failure of other members of TfL to disclose the name of the employee accused of shaking the perpetrator’s hand. The woman has written a complaint with TfL. Tell MAMA, who is supporting the woman, will also be writing to TfL to raise our concerns about their handling of this Islamophobic and racist incident. The British Transport Police are investigating the incident. In 2017, Tell MAMA verified 107 reports of Islamophobic and anti-Muslim incidents on transport networks. In the interim period of 2018, between January and June, Tell MAMA verified 17 incidents which took place on transport networks. Tell MAMA has documented several examples of Muslim women being assaulted, abused, or sexually harassed on trains. Other examples highlighted in our previous annual report show how Muslim girls and women have been called “ISIS” or referred to as “terrorists”. Individuals can register complaints against the TfL online, in-person, in writing, or over the telephone, according to London Travel Watch. The online retail giant Amazon has removed copies of Stephen Yaxley-Lennon’s (Tommy Robinson) co-authored book ‘Mohammed’s Koran: Why Muslims Kill For Islam’. The book, first published in 2017, was available to purchase on February 25, 2018, but following Facebook’s decision to ban the far-right provocateur from its platform and Instagram yesterday, the book is no longer available. To search for the book through Google brings up the notification that the page is ‘no longer functional’ on Amazon. Nor can you find the book through Robinson’s author page on Amazon, as the listing remains unavailable. His book ‘Enemy of the State’, however, remains on sale. Amazon states that products “that promote or glorify hatred, violence, racial, sexual or religious intolerance or promote organizations with such views” are prohibited from sale. Facebook had warned Robinson that if he continued to break Community Guidelines on the platform, he risked having his personal and professional pages removed. Posts which broke guidelines on hate speech included a post calling Muslims “filthy scum bags”, a post urging people to terrorise and behead those who follow the Qur’an, and a post which urged individuals to “make war” on Muslims. Nor will Yaxley-Lennon be able to create new profiles or business pages on Facebook in the future. YouTube remains the only major platform where Robinson remains active, despite the Google-owned video sharing platform de-monetising his channel for breaching advertising rules. Last November, PayPal banned Yaxley-Lennon from its service, and Twitter banned him in March 2018. Nor is ‘Mohammed’s Koran: Why Muslims Kill For Islam’ without heavy criticism. The book is also unavailable from Waterstones. A friend of an Islamic State terrorist who plotted to assassinate the Prime Minister has been jailed for eight-and-a-half years. Mohammed Aqib Imran, 23, planned to travel for jihad, while Naa’imur Zakariyah Rahman, 21, was set on a suicide attack on the heart of Government. Imran, from Ombersley Road, Birmingham, researched travel and tried to secure a false passport in online communication, fearing his mother would stop him if he used his own passport. Rahman, from Finchley, north London, admitted helping his friend by recording an IS sponsorship video for him, the Old Bailey heard. Following a trial in July, Rahman was found guilty of preparing acts of terrorism and was jailed for life with a minimum term of 30 years. Imran was convicted of possessing a terrorist handbook entitled How To Survive In The West. Following a retrial, former student Imran was also found guilty of preparing acts of terrorism abroad on or before November 28 2017 in December. On Tuesday, Judge Nicholas Hilliard QC jailed him for eight years and six months for preparing to join IS with an additional three years and six months on extended licence. He also handed Imran three years and nine months in custody for possessing the terrorist publication on his Kindle, to run concurrently. The judge accepted Imran was “immature” for his age and “more of a follower than a leader”. While he did nothing to put off Rahman from carrying out his plot, the judge said he would not sentence him on the basis that he encouraged it. He said: “Mr Rahman was a very dangerous man and that must have been evident from any time spent with him but also from the messages the defendant exchanged with him. Acting Commander for the Met Police Counter Terrorism Command, Alexis Boon, said: “The idea was that Rahman would kill the Prime Minister, and Imran would subsequently have a video from a martyr recommending he be accepted into the terrorist organisation. Such a video would have held weight with Daesh. “Of course, this was never going to happen because MI5 and the Counter Terrorism Command had been investigating the pair for some time and in fact a covert police officer had been meeting with Rahman to establish how serious his plans were. Scott Wilson, who helped lead the response to the 2017 London Bridge attack, said monitoring the teenager would cost millions of pounds and the security services and police would “never be able to take their eye off her” if she did return. Mr Wilson, who was UK National Counter Terrorism Co-ordinator for Protect and Prepare until last summer, said: “When you look at all the background to her going out there, I know they are trying to say she was a groomed child, but there was a lot of planning that went in with her and her group to get herself out there. “It’s not just the bringing her back, the deradicalisation programme; the security services will end up spending years monitoring her. “They will never be able to take their eye off her for the simple reason that they don’t know what could happen. If she did do something in the UK, the Government and the security services would get the blame for it. It was also reported that Abu Hamza’s son, Sufyan Mustafa, 23, is fighting the decision to revoke his British passport. “I don’t think the British Government should give her the way to get her out of Syria and get her back here, that’s the point,” he said. “If she gets back here then it’s on their plate to deal with it. “If you start making a free way for them to get back then where do you stop? “I can see floodgates opening. I don’t think we should make it easy. If you make it easy then you’re just opening the floodgates for it and suddenly you’re monitoring people forever. “I don’t sound very sympathetic because I just see the consequences. I dealt with London Bridge on the streets. Begum’s father, Ahmed Ali, said his 19-year-old daughter should face justice in Britain despite previously appearing to back the removal of her citizenship. Mr Ali told ITV News: “I don’t think he’s (Sajid Javid) done the right thing because she is a British citizen, and if it turns out she has committed any crimes, then she should face justice in the UK. “She belongs to this country, she belongs to England. This is the note that Facebook have put out. This is extremely welcome news and a long time coming. We would like to thank Facebook in the decision it has made. One of the biggest questions we face is around what we allow on Facebook – and we spend a lot of time trying to get this right. This is hard and critically important. We want Facebook to be a place where you can express yourself freely and share openly with friends and family. At the same time, when people come to Facebook, we always want them to feel welcome and safe. Tommy Robinson’s Facebook Page has repeatedly broken these standards, posting material that uses dehumanizing language and calls for violence targeted at Muslims. He has also behaved in ways that violate our policies around organized hate. As a result, in accordance with our policies, we have removed Tommy Robinson’s official Facebook Page and Instagram profile. This is not a decision we take lightly, but individuals and organizations that attack others on the basis of who they are have no place on Facebook and Instagram. Sajid Javid has insisted there are not enough powers to tackle online abuse and extremism, adding he is “taking very seriously” calls to reform treason laws. The Home Secretary was pressed by MPs to act urgently to force major internet firms, such as Facebook and Twitter, to do more to stamp out extreme content. Conservative Tom Tugendhat, chairman of the Foreign Affairs Select Committee, also raised concerns over “vile extremism” spread over the internet which encourages people to join terror group Islamic State and others. He added: “Will (Mr Javid) agree with me that the opportunity has really come to change the law here and to look at how we can charge people with treason? He noted the Government has received new powers to fight terrorism via the Counter-Terrorism and Border Security Act 2019, adding: “He also raised the issue of further potential powers, including powers around treason. Barry Sheerman, Labour MP for Huddersfield, earlier said he has not received half as much “vile stuff” compared to his female colleagues. He added: “I get threats, I’ve had people arrested for some of the things they’ve posted on my website. Mr Javid replied: “I very much share the sentiment of (Mr Sheerman). Mr Javid said Ms Sherriff and other MPs have suffered from “vile content” directed at them online, noting this was “absolutely unacceptable”. He went on: “That’s why more needs to be done. “We are working closely across government, especially my department with the culture department, on the online harms white paper. Jack Letts, 23, speaking from the Kurdish jail where he has been held for two years on suspicion of joining IS after he ran away to Syria in 2014, said he missed his mum, pasties, and Doctor Who. Mr Letts, a former pupil of Cherwell School, also confessed that he was pleased when he first heard news of the Paris terror attacks in 2015, and blamed his reaction on his experiences of coalition airstrikes in Raqqa. The Home Office said: “In recent days the Home Secretary has clearly stated that his priority is the safety and security of Britain and the people who live here. Mr Letts, who was a teenager when he fled to Syria, has not seen his parents in half a decade, and is missing some elements of his life in the UK. Mr Letts’ parents, John Letts and Sally Lane, from Chilswell Road, Oxford, are awaiting trial in the UK accused of sending money to their son. This is not the first time Mr Letts has spoken to the British media since he fled his home. In 2016, he told Channel 4 News that he missed Krispy Kreme doughnuts and kebabs, and had narrowly survived an airstrike with just a “scratch”. And when asked if he was an IS fighter, he replied “Currently I’m not” before saying later in a statement that he opposes the militant group. Mr Letts’ interview comes the day after the family of Islamic State bride Shamima Begum confirmed they would be challenging the Home Office’s decision to revoke the 19-year-old’s British citizenship. Ms Begum was one of three schoolgirls to leave Bethnal Green to join the terror cult in 2015 and recently gave birth to a baby boy, her third child.